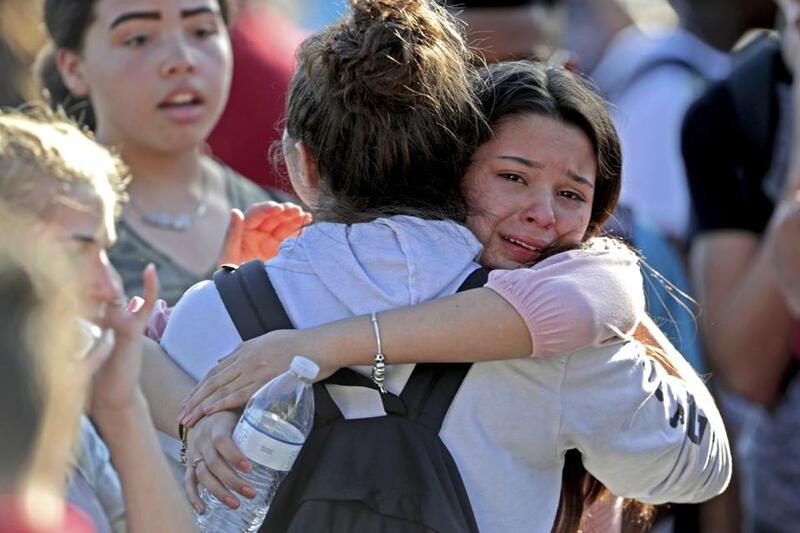 Students released from a lockdown embraced following a shooting at Marjory Stoneman Douglas High School in Parkland, Fla. It sounds like some sort of especially dark satire: In a nation unwilling to take even modest steps to prevent the next Columbine or Parkland massacre, schools have begun training students to patch up their classmates’ gunshot wounds. As America attempts to stanch the steady stream of massacres inside its schools, training like Stop the Bleed — designed to teach professionals and the public how to respond in any kind of bloody mishap — has been repurposed to teach schoolchildren how to fend for themselves in a mass shooting. Soon, this kind of thing could be as routine at high schools as a fire drill: Over the summer, the Department of Homeland Security posted a $1.8 million grant to develop something called School-Age Trauma Training, “to deliver free to the public, lifesaving trauma training to high school age students for mass casualty events,” according to the grant. In a country where federal officials spent over a year promising to ban bump stock devices that turn a semiautomatic rifle into something approximating a machine gun, only finally getting around to it last month, teaching high schoolers to patch up their classmates seems to send an unmistakable and terrifying message: You’re on your own. For anyone sending their kids off to school every day — and my daughter just started preschool — it’s all tough to stomach. Meanwhile, a Florida commission formed in the wake of the shooting at Marjorie Stoneman Douglas High School endorsed a program that allows for teachers to carry guns in schools. Neither idea does anything to address school shootings until the moment someone opens fire. What kind of dystopian educational system involves arming teachers and turning JV basketball players into combat medics, packing and dressing their friends’ wounds while the math teacher returns fire? Dr. Eric Goralnick is trying to figure that out. But keeping those two paths — call them prevention and preparation — separate in our thinking isn’t easy. When the actual action on prevention is so measly, focusing on preparing for tragedy can make the unthinkable feel inevitable. We send our kids off to school knowing that they will prepare not just for college but for the possibility of one of their classmates charging in with a gun. Fire and earthquake drills are one thing, but there’s no National Fire and Earthquake Association spending millions of dollars on lobbying to make sure large numbers of people fall into fissures. So, is insisting that teens picture the bloody aftermath of a shooting going too far? Would the trauma associated with that do more harm than good? What are the unintended consequences? In February, the Gillian Reny Stepping Strong Center for Trauma Innovation and the Center of Surgery and Public Health at the Brigham, Harvard Medical School, and Harvard’s T.H. Chan School of Public Health will host a conference to begin to answer those hard questions. And a trial program that will study whether school-aged children would actually be able to perform these kinds of lifesaving measures could start in the next few months. Meanwhile, doctors all over America have become prominent voices standing up for gun control. Their voices were strong enough that the National Rifle Association warned physicians to “stay in their lane,” as if the damage done by firearms is outside the purview of the people in the ER. But that doesn’t preclude working to make the next mass shooting — and there will be another one, and another one, hard as that is to accept — a little less deadly. Because the hard truth is that until Congress takes real action on gun violence, our kids are on their own. The best we can do is get them ready.